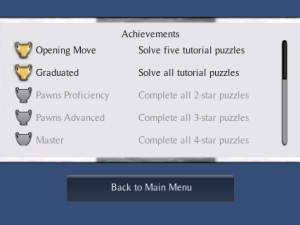 I have been adding OpenFeint Achievements (with Game Center integration) to my game, Pawns! for iOS. Here is a collection of time-saving tips that I wish I’d had to start with, particularly the Troubleshooting section. I include links to documents and forum posts that gave me useful answers. Some of this information is specific to games made with Unity, but most isn’t. Some details may change when new versions of the OpenFeint SDK are released. Â° The instructions in the UnitySupport folder in the OpenFeint SDK covers most of what you need to know. OpenFeint supports offline Achievements. After the first successful OpenFeint login and connection to the network, the player can view OpenFeint’s Achievements dashboard even if the device is offline. Achievements earned offline will be synchronized with OpenFeintâ€™s servers later. But users who refuse OpenFeint in the first place cannot see the list. Because of this I decided to implement my own Achievements page, as well as my own notification at the end of each level when theyâ€™ve earned one or more Achievements. It was more work than relying on OpenFeintâ€™s dashboard and notifications, but itâ€™s nice to know that even players who don’t use OpenFeint will be able to see their achievements. Â° The instructions state to add your â€œOFGameCenter.plistâ€ file to your Xcode project, but as usual they donâ€™t suggest where. Put it in the folder OpenFeint/resources. Â° Before testing your OpenFeint features, go to your OpenFeint developer dashboard and register the OpenFeint user youâ€™ll use for testing. I used my regular OpenFeint user for this, or you could create a new account beforehand using any OpenFeint-enabled app. If you have beta-testers youâ€™ll unfortunately need the email and password of each of their logins, and your beta testers may not wish to share their passwords with you. So you will either have to create new email accounts and associated OpenFeint users for the testers to use, or ask them to create new test accounts first and send you the particulars. Â° Apple recommends you do not use your real Game Center user for testing. To set up a new test account, simply run Game Center on your iOS device, and use it to log your regular account out before you start to test. This tells Game Center to prompt you to login (or create a new user) when it starts up in your game. Â° When your app is first run, OpenFeint will let you pick from a list of existing users on the device (if any) or allow you to type a new one. If your test user wasn’t already active on this device you will need to link this new profile to the test user’s account. Do this in OpenFeint’s in-game dashboard: open the user profile and give the test user’s email address and password. Once thatâ€™s done OpenFeint should then attempt to connect to Game Center. Since you logged out from Game Center beforehand it will prompt you to login. This is where you can create a new Game Center user. Â° Donâ€™t forget to also test the offline mode. After a successful OpenFeint test, try running the app again with no network connection, and try out the OpenFeint buttons. Â° If OpenFeint doesnâ€™t mention Game Center at all at startup, double-check that you properly enabled Game Center in OpenFeintâ€™s initialization settings. Â° When testing offline mode, if you get an error that says that offline mode was not enabled, check that an up-to-date copy of your openfeint_offline_config.xml is in your Xcode project, inside the OpenFeint/resources folder. Â° I had a problem with OpenFeint 2.7.5 notifications never showing when an Achievement was unlocked. I posted a solution for this last month. Alternatively, see the section â€œAchievements and Offline Modeâ€ above for reasons to write your own notifications instead. If the achievements still aren’t visible, then make sure you registered the test user in OpenFeint’s Developer Dashboard. Also double-check that you added the test user’s email and password on the player dashboard on the device. Adding OpenFeint and Game Center wasnâ€™t difficult, but there was some trial and error, a couple of gotchas, and I had to do a bit of searching for some of the answers. Hopefully these tips will smooth the way for others, and for myself when I start working on my next game. This entry was posted in Blog Topics, OpenFeint, Unity3d and tagged ios, openfeint, Unity3d on December 8, 2010 by Matt. Just wanted to say that I love your posts. I’ve been working on a game for the iPhone using Unity3D for a little while now and found your site as great resource for information. Definitely please keep up the great work! This talk about OpenFeint and Game Center has me wondering though. I know that OpenFeint came before Game Center, but aren’t they now filling similar roles? What is the advantage of having them both in an app together? Is it to fill an area that both one lacks of the other? 1) Apple may be more likely to feature you if you support GC. GC icon shows up next to your game in the App Store. 2) OpenFeint has a large user-base, and tools to market your game to them. 3) You’ll show up on more friends’ lists. Of the two services, OpenFeint is the more mature from a marketing point of view. They offer ways to promote your game within their network, such as free-for-a-day, in-game banners, stuff like that. GC’s adoption has been slow. So I think OF offers more bang for the buck at this time. But GC isn’t going away, it’s preinstalled with iOS 4.2, and I suspect Apple will expand it’s features, maybe hook it into the Mac App Store. And OpenFeint, rather than locking devs into their own service, is heavily pushing developers to support both- they’ve said that GC support is needed “if you want to be featured” (I’m not sure yet if they meant by themselves or by Apple.) That might just be an attempt by them to stay relevant as GC rolls over the competition. I have a question though! Does this method make it possible to post on OF and GC at the same time? Is this enough? I mean, I just have to do my usual things and then this bridge will post them on GC as well or not? Yes. I only am using Achievements myself, but I followed the steps described in http://www.openfeint.com/ofdeveloper/index.php/kb/article/000089, and am now seeing Achievements posted to both services. Something else I just verified: I logged out of OF, yet GC is still active. So the player can opt out of OF but their achievements should still post to GC, if the player has a GC account active on the device. I have been reading through several docs on OpenFeint Support site & Other resources on the web to learn how to integrate OpenFeint with UNITY3D. But unfortunately there is nothing i found useful to Start with. I have no clue how do i start with OpenFeint in Unity3d. Once you have downloaded the OpenFeint SDK, look for a UnitySupport folder inside. There is a README file inside that walks you through how to add OpenFeint to a Unity iPhone project. Step 3: Add leaderboard or achievements. See the SDK file OpenFeint-Unity-Documentation. It has examples near the end. You can search the Unity forums to see what examples other people have posted. My article above is intended to fill in some gaps in the documentation, and solve problems that I ran into as I did these three steps. Wish I could help but I haven’t done leaderboards yet. My next game will probably have them, but that’ll come too late to help you I’m afraid. Until then, all I can say is, doublecheck the basics: that the feature is turned on in the OpenFeint developer portal, and that you are sending the correct leaderboard id. They have had server issues over the last month, so there’s a small chance the problem is on their end. You can keep an eye on the OF forums and twitter to see if other people are reporting problems as well. First, thanks for this post, it helped me a lot in adding GC support to my OF game. It took me longer to track down and fix this bug than it originally took me to integrate OF in the first place! I have notified OF of the error. Thanks again for the great posts (I also found the one about Achievement Notifications very useful)! I corrected the filename in the post, and added a couple sentences about the name being wrong in some versions of the documentation. Great tip; thanks!